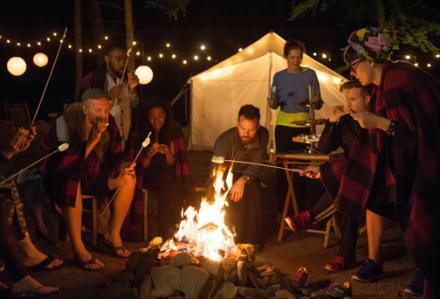 The Project Runway Designers Go Glamping, So What is That? Well, apparently, glamping is one way that Project Runway can finally have an episode that is more Kumbaya-like than spewing all of the drama! But no, really, glamping is glamorous camping. I am not sure about the glamour part, but experiencing nature really did seem to calm these designers down. It was great seeing them have some fun by zip-lining or whitewater rafting, or just sitting around the glamp-fire roasting marshmallows. Even though nature was cleansing and relaxing for the designers, I am not sure it was a benefit to all when it came to finally finding inspirations for their pieces this week. This week’s challenge was to create a look, of any kind, that was inspired by nature and the activities experienced while glamping. The look was not to be worn while in nature, just inspired by, and so it still needed to be high-end and editorial. This was a 1 day challenge and the suggested budget was $300. Allison Williams, from the hit TV series Girls was the guest judge this week. She did a great job and offered some excellent thoughts and critiques for the designers. So before I get to the top and bottom looks, there were a few interesting workroom events to discuss. One such workroom event was that really there was no drama this week. It was a nice change of pace from the past several weeks of fussing and feuding we’ve seen. I think the only snide comment was from Ken, who was still a bit upset with Alexandria from last week, and he called her a tiger. I can’t feel too badly for Alexandria because it was still quite evident this week that she is not there to make friends or even be friendly or slightly cordial. I think it was Karen and Helen who asked her how her work was going and she barely responded and walked out of the sewing room. I am sure the show’s process is chaotic, but is it that hard to be somewhat nice? So with a fairly calm workroom this week and everyone appearing to have had a refreshing glamping experience, it would seem that the runway show this week would be phenomenal this week right? WRONG! But apparently phenomenal enough that the all important Tim Gunn save was used! I have to say I was very underwhelmed this week. Justin and Karen I felt were a shoe-in for the bottom 2, but I think that 3rd spot could have gone to more than just Ken. I think Bradon and perhaps even Kate should have felt very pleased with their safety this week. Bradon’s look was so reminiscent of his 1st week’s look and was barely put together in time. I am hoping this week was just an off week and he is back on track for next week! I didn’t have the same problem with Ken’s look as the judges, but I did feel it was a bit safe. While it did fit great, it just didn’t seem to push the boundaries. But as far as the bottom 2, Justin and Karen, the judges were spot on. I am not sure ultimately who I thought really deserved to go home and I could have understood the judges’ choice to send either home. Justin’s look, while very risky, bold and experimental, just really didn’t work. I thought it looked like someone walked thru a spiderweb. It was not polished at all. However, I kind of applauded his effort and hard work that was clearly put into the garment versus Karen’s very basic ombre sunshine yellow strapless maxi. I didn’t even notice the boots she paired it with until later and that was very perplexing. I am just not sure after seeing the many other garments, and all of the work, what she spent her time with this week in making this dress. It was just so basic. It really didn’t matter as Justin was the one chosen to go home, but, drumroll please, Tim used his save. It was a very sad moment and emotions were really flying all over the place. I am just not sure this save should have been used so early. I do like Justin and I did like some of his earlier pieces. However, I just don’t think his aesthetic and point of view has formulated itself yet. So far, he hasn’t had a WOW moment. However, Tim felt strongly about using his save, so I respect his decision. So the bottom was seemingly a no-brainer this week, but the top group, more so the winner this week, was a bit more perplexing for me. I would have never put Alexandria in my top 3, much less deemed her the winner this week. I do see why the judges probably put her in the Top 3 as the runway was a sea of long gowns this week, and so her sportswear garments did stand out in that respect. I just wasn’t a fan of the droopy drop-crotch pants and the denim top seemed very ill-fitting. I thought Jeremy’s breathtakingly elegant and fully inspired, bias cut cream gown was by far the better choice for a winner. It was so touching how he made a garment with a love letter he had written. Alexander also did a great job this week. I have not been a fan of his, but I was very impressed with this navy blue and black fitted gown. I will say, the bottom did seem very heavy and perhaps even difficult to walk or move around with, but overall, it was still very beautifully crafted. I also wanted to throw a quick honorable mention to the person I would have added to my Top 3 and that is Dom. I have slowly been coming around to her work and I really enjoyed her piece this week. 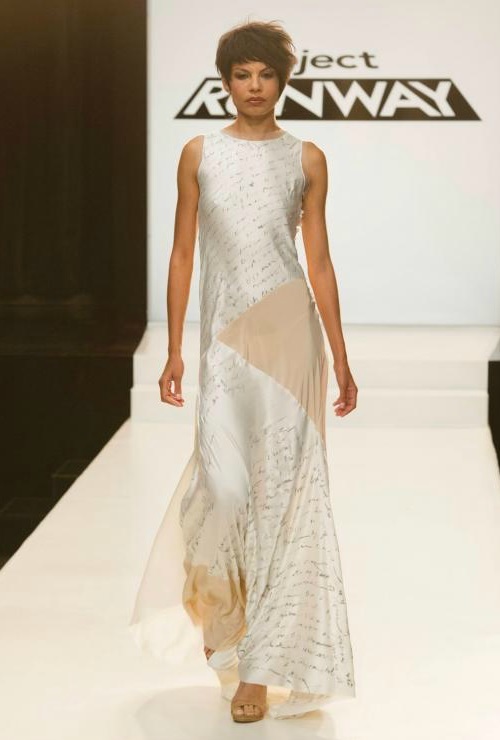 The print was great and the neckline was very elegant and classy. 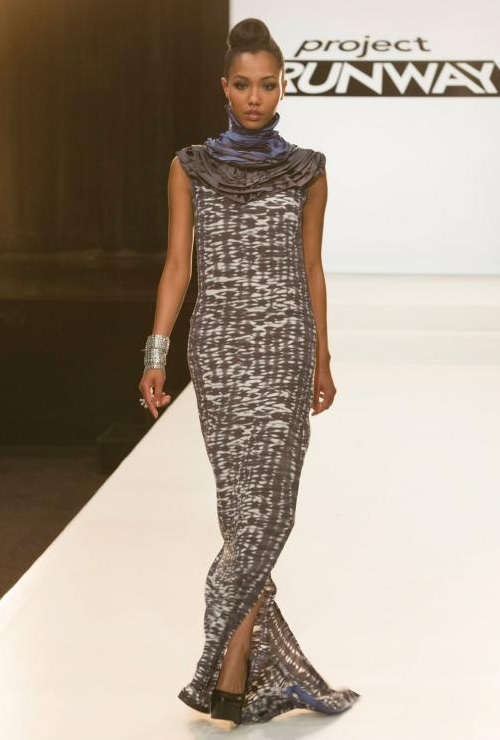 Project Runway’s Perfect Formula for Surprises & DRAMA!! ← Slater Zorn: You Can Dress in Style and Root for your Team! My favorite episode so far this season! Your observations were my own. I’m not a fan of droopy pants either but I thought her design was almost a cross between that and a crazy sort of skort (which I’m a fan of). It had to be her or Jeremy this week. Let me know if you see this reply back. I try and reply to my comments, but never sure if people see them! I was so happy to see an un-dramatic episode. It was a nice change of pace! I did love Jeremy’s gown though. So gorgeous and personal. I’m defending Alexandria’s withdrawn behavior because Ken was abusive to her in the last challenge; and no one backed her or defended her, and she came close to going home. Their group dynamic threw her off her game, and she was fighting for her survival in the competition. Remember Ken saying to her, “Don’t you even look at me!” His tone— directed at her—was NASTY. I’m interested in what else Dom has to show us. So far, her entries haven’t shown much variety except for the one she did with Alexandria. That whole episode was pretty bad w/ the dramatic antics! That is why this episode being much more mellow was a nice change of pace! I was totally shocked by the judges decisions! I was so certain that Alexandria was out! I almost fell out of my seat! Alexandria is quckly becoming a wimp and should learn to stand her ground, and why take it out on Karen or Helen? I liked Alexander’s gown and I could see where nature gave him the inspiration. Not sure what happened to Kate this week, it was a giant fluffy white ball with some kind of weird pleather cut out thing over it. YUK! I didn’t really see the inspiration of nature in many of the designs. At least Tim Gunn used his save for Justin, perhaps he feel a little guilty after he did not discourage Justin from using the hot glue technique. For this past week? I mean, I didn’t love her drop crotch pants, but I didn’t think she would be out. My pick would have been karen, not Justin. But I think it was too early for the save, but, oh well, everyone has to be on point now!